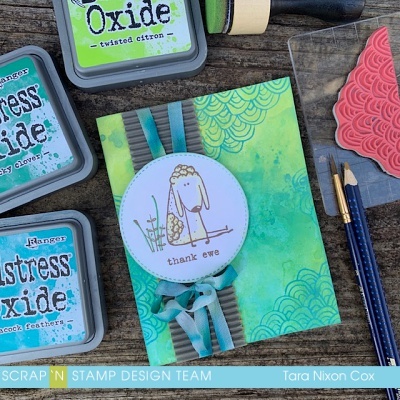 Today I've got another card for you I created with the new "Funny Farm" stamp set by Tim Holtz together with the "Media Marks" set. After I created my project for the 'This Puns for You" Blog hop, I kept going, creating a similar inky background and this is what I ended up with :) Like my first card, my background features Twisted Citron, Lucky Clover & Peacock Feathers Distress Oxide Inks. 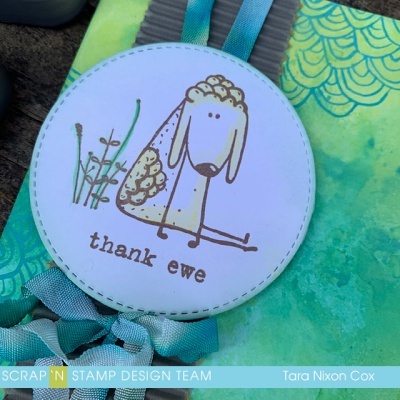 I love this sketchy scallops design in the Media Marks set, especially since it seemed to mimic the curls on this sweet little sheep! I kept this card super simple- just my background and the image on a die cut stitched circle and some simple coloring with watercolor pencils. For texture, I layered it on a piece of corrugated cardstock from my stash with some yummy crinkle ribbon (which I dyed with Distress Ink) wrapped around it. Sweet & Simple and I kinda love it... hope you do too!